Anyone who was born or raised in the Midwest knows that Chicago is known for many unique food choices – their Chicago Dogs, their Deep Dish Pizza, and best of all – their Italian Beef Sandwiches. 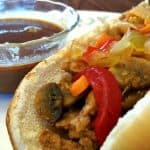 An Italian Beef Sandwich is thinly sliced roast beef, literally melting in it’s own Au Jus, and thrown down on a hoagy roll and smothered in hot Giardiniera. And yes personally, I like mine wet – I’ll dip later (it’s a Chicago thing). So at the request of one of my fellow Midwestern readers, this is my vegan attempt to recreate that wonderful taste of Chicago. Don, this one’s for you. I’m using Butler Soy Curls for this recipe today. Soy Curls are non-GMO soybeans that have been dried and textured to resemble shredded meat. Soy Curls are 100% Natural, contain the whole soybean, are high in protein and fiber, are Gluten-free and Vegan, and are 100% non-GMO – which means they contain no chemical pesticides. As usual, the link and photo are Affiliate Links – meaning if you click on them and buy them from Amazon, I will make a penny or two. They are also available at Whole Foods. Check your closest natural food store for availability. For those avoiding soy, thinly sliced Seitan would also work in the recipe – like this Meat Lover’s Seitan Meatloaf I made last week. The broth is the main event in this recipe. The star of the show. 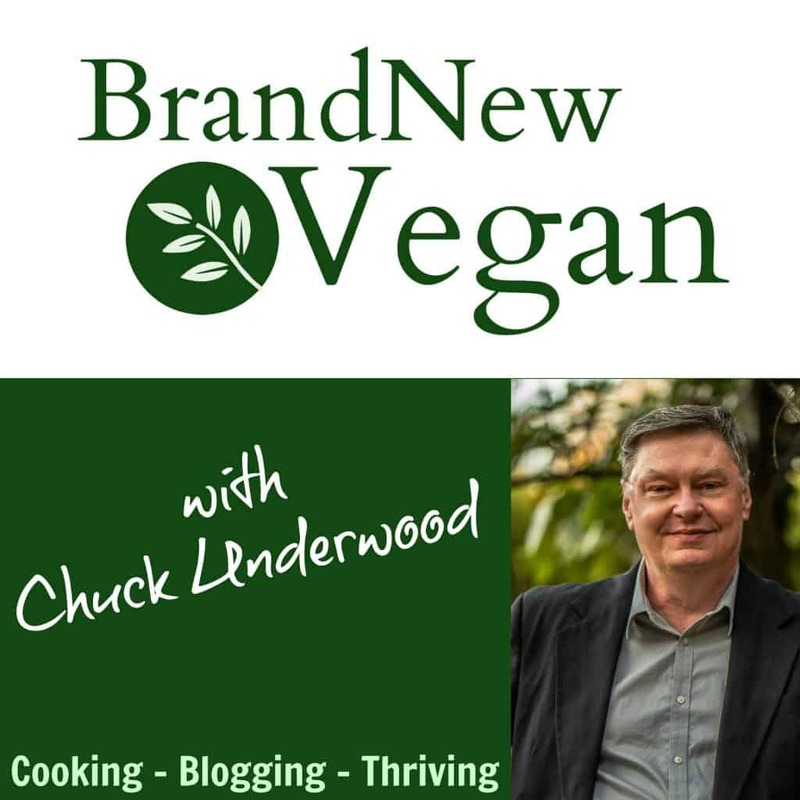 And the challenge was to create a ‘beef’ broth – without using any real meat. So although there are quite a few ingredients in this recipe – they are all necessary in order to create that Italian flavor profile we need for the Italian Beef. I started by sautéing 1/2 an onion, 8oz of white mushrooms, and 3-4 cloves of garlic until softened in a tiny bit of Veggie Broth, and then slowly adding the remaining ingredients one by one. Once the broth was combined and boiling, I added the 8oz package of Soy Curls to soak up some of the flavor. I did not rehydrate them first – I just opened the bag and tossed them in. Turn down the heat and let that simmer for 30 minutes or so, and then drain the broth from the curls and save it. You’ll want that Au Jus for dipping later. 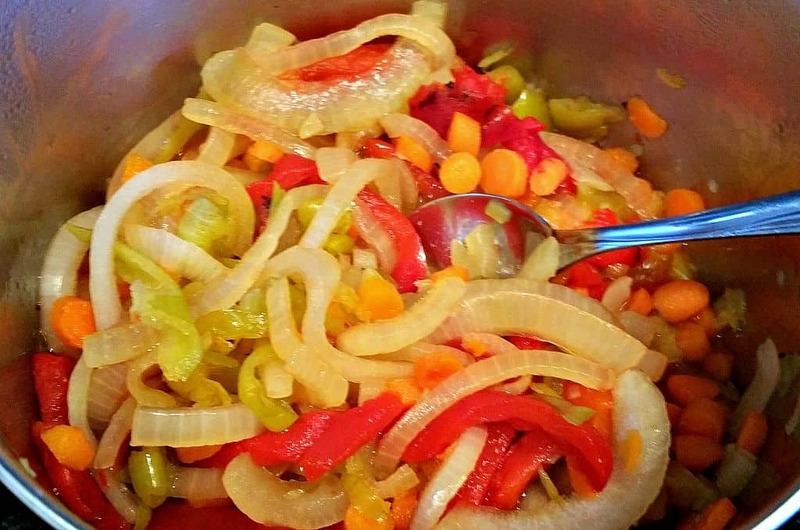 Giardiniera is an Italian condiment of pickled vegetables, commonly used as a topping on Italian Beef Sandwiches. Although there are bottled versions available in your Grocery Store (look in the pickle section) I decided to make my own. That way I can leave out any oil that commercial varieties may contain, and I can control the sodium content. I used the other 1/2 an onion, 5-6 baby carrots – sliced thinly, about half a jar of Roasted Red Bell Peppers, and half a jar of Pepperoncini Peppers (plus the juice). Simmer in a small saucepan until the vegetables are soft and tender. Feel free to add celery and/or cauliflower if you like. (I’m not a cauliflower fan so I left them out). 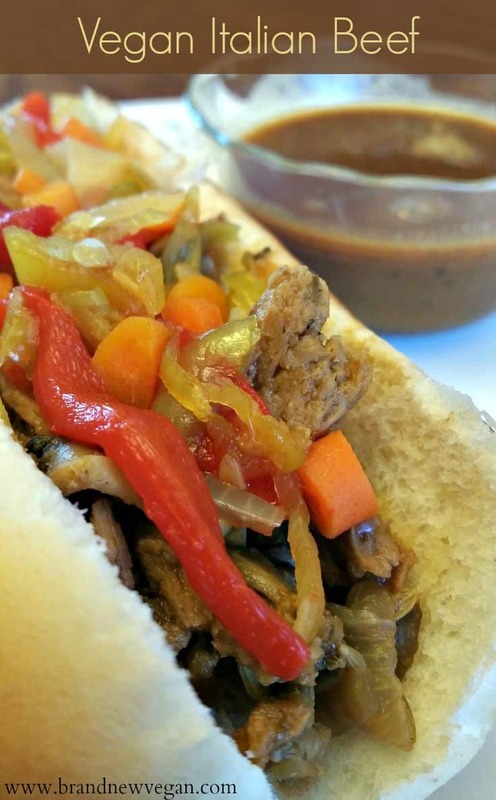 Pile your ‘meat’ on your favorite whole wheat Hoagy, add some veggies, and get dippin’. 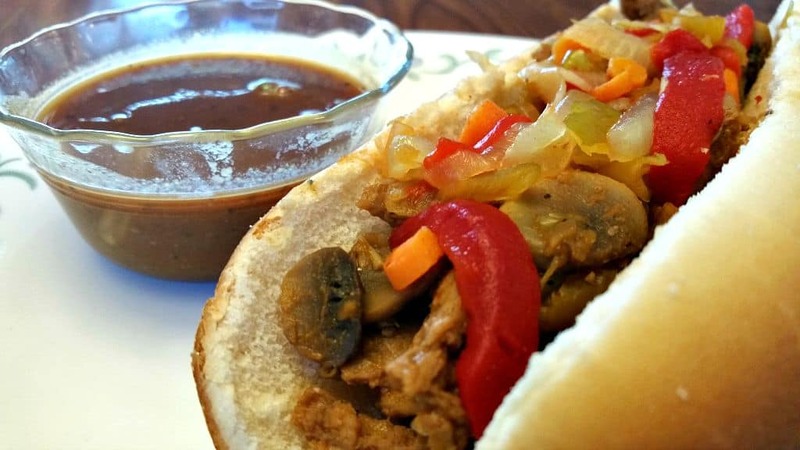 A Vegan Italian Beef Sandwich perfect for dipping. Marinated Soy Curls cooked in a homemade Italian 'beef' broth, and topped with spicy homemade Giardiniera. Not quite Chicago - but close! Drain soy curls from broth and save broth for dipping. Add the cooked 'meat' to your favorite bun or roll and top with Giardiniera. Dip in Au Jus and enjoy! Yum! What size jars of peppers did you use when you say you used half? 16oz Jar. So use anywhere from 6-8oz. Made this last night – OMG, so good! Very, very delicious. I doubled the broth recipe because we don’t drink beer, and I wanted to use up more of the bottle I bought. So glad I did! I am going to try pulled jackfruit in the leftover broth. Great recipe! I’ve made this recipe 3 times now and it meets my taste bud memories pre-vegan every time! If you are looking to complete the Chicago Beef experience with Chuck’s recipe one would seek out Gonnella Italian bread as many of the famous Italian Beefs joints in Chicago exclusively use. Unfortunately Gonnella bread is no longer vegan (I called) so an Italian bread substitute is required. But if you add any original “Chicago-style” Giardiniera packed in olive oil and crinkle cut fries you’ve nailed it vegan style! Love it.